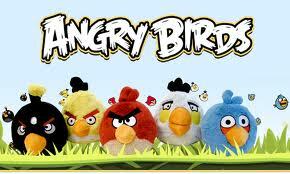 Angry Birds are everywhere. Correction — Angry Birds IS everywhere. I was first exposed to the concept while standing in line at Nordstrom’s Rack with my mid-30’s daughter and her purchases. She suddenly squealed with delight as she did at age five when she spotted the newest Strawberry Shortcake doll. “They have Angry Birds,” she insisted, showing me a silly stuffed- animal in the shape of a bird. It was red with a black beak and black head feathers. “What in the heck is an angry bird?” I asked. And I got the usual, “Mother….” that only a daughter can stretch into to a full sentence that says, where have you been for the last decade? I still didn’t quite get it; ok, it’s a game you play on your phone, a silly video game, waste of time most likely. “And there are others?” I asked as I pulled out a yellow one and then a smaller blue one. I was lost by then and honestly didn’t care enough to inquire further. The next thing I knew I was Christmas shopping with a close friend who had to find an Angry Bird for her nephew for Christmas. We were eating lunch so I texted my daughter to ask where you could buy Angry Birds and if there was a store close by. She wrote back quickly telling us the name of the store, exact location and how much they were. So we returned to the mall to buy an Angry Bird. This store had the full collection including the pig, so as my friend purchased the red bird, I decided to buy the pig for my daughter. A waste of $5.00 but aren’t most Christmas presents? The next day I mentioned having seen the pig doll and was told, no one wants the pig; you try to kill the pig. She wanted a red one. I still didn’t get it, the concept was foreign to me, but I also bought every Strawberry Shortcake doll they designed and lived with the ever growing scents in the house. For my birthday, I opened a present I had loudly hinted for all fall. A new Kindle Fire! I was thrilled. I was only going to read books but would also enjoy streaming an occasional movie or retrieving e mail when I was away from my computer. Angry Birds appeared in my apps section. It was free. I downloaded it. I don’t know anyone who has played who hasn’t become an addict. It’s like cocaine (I guess) – one hit and you are hooked, hook, line and sinker hooked. Hour after hour after wasted hour. I am embarrassed. I am ashamed. I am guilty. I am determined to kill the pigs…. This entry was posted in Uncategorized on January 17, 2012 by cwesala.